Of all the gluten-free baked goods we've tried so far, I would have to say the Macarons and the Snickerdoodles have been the best. In the case of the macarons, there's a texture we're not used to eating all the time. It's a uniquely "macaron" or "macaroon" texture. And, personally, I've had way more macarons from TJ's than from anywhere else. But in the case of the snickerdoodles, they approximated a very "normal" texture without using gluten. It's harder to imitate something that's usually made with gluten than it is to just make something different. So making a gluten free cupcake seems like it should be pretty close to impossible. But I've gotta say, they came incredibly close. Once again, they nailed the flavor of a chocolate cupcake. I personally liked the frosting, too, although Sonia thinks it was too heavy for her tastes. I must admit, it was thick and very buttery. But it had a nice vanilla taste, and it blended well with the chocolate cake. The cake part was super-moist. 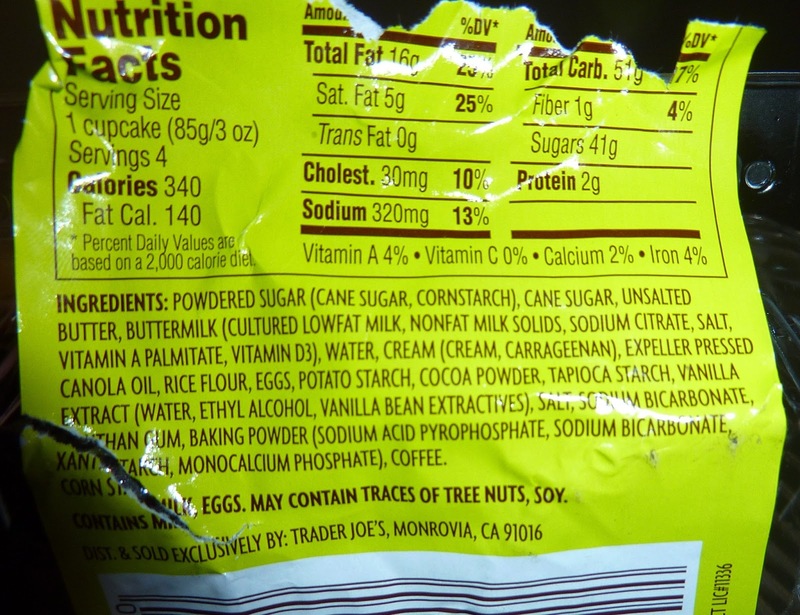 It broke apart in the same way any chocolate cake would, but once you started chewing it, there was just a tiny hint of what I might call "starchiness." It's like portions of the cake crumbs wanted to stick together just a hair more than with a glutenful cupcake that perfectly "melts in your mouth." But that's nitpicking. Really. The effect was very subtle, and if I hadn't already known that these were gluten-free cupcakes, I might not have noticed it. I think it's gotta be the "potato starch" that you can see there in the ingredients list photo, which wound up looking like the culinary equivalent of an American Apparel ad. I washed it all down with a tasty caramel latte, and my tummy was a happy camper. And sure enough, my stomach didn't puff up the way it does when I eat regular cupcakes. I should probably do this gluten-free thing full time. With products like these, I wouldn't feel like I'm giving up the world. The checkout guy at Trader Joe's exclaimed, "Enjoy the cupcakes. They're excellent!" when I bought them. He's certainly not wrong. Sonia's only complaint was the heaviness of the buttercream, although I was a fan of the icing. And my only complaint is the oh-so-barely-there weirdness of the cake texture. Definitely, if you're eating gluten-free out of necessity, these cupcakes will be your friends. Sonia gives them 4 stars. I think they're worthy of a 4.5. They should be excellent - they have over 9 teaspoons of sugar in each cupcake! 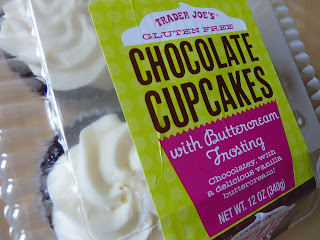 I just picked up a package of these gluten free cupcakes in mint chocolate and they are DELISH! They are actually better than the ones I've from a local gluten free bakery. The price is right, 4 for $3.99! YUM! We'll have to look for them, CandidabBrava! Just got these - and they are good - as long as you get rid of at least 3/4 of the icing!! 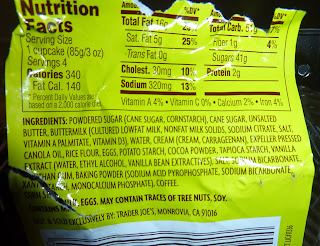 If you want to actually eat cake: don't buy these. If you want an excuse to just eat icing: go for it! !